October | 2013 | DEBtastic Reads! Thank you to everyone who stopped by to help shine the spotlight on Jo Knowles and her new YA novel, Living With Jackie Chan! I used a random number generator to choose a winner from the eligible comments from the interview. 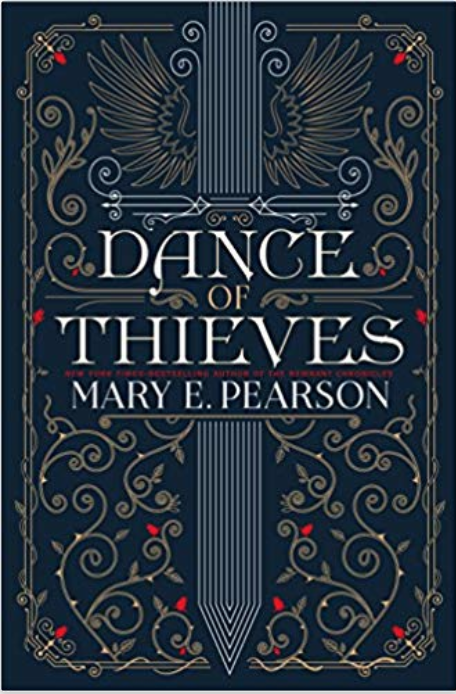 Who is the lucky winner of a signed copy of this awesome novel? Congratulations Jpetroroy, commenter number 16! Please respond by emailing me at just kid ink at yahoo dot com. Let me know to whom you would like the book signed and your mailing address and I’ll be sure your prize is on its way as soon as possible! Thanks to everyone for stopping by! Please come back again for future book buzz, interviews, and prizes! Welcome To The Spotlight: Jo Knowles and Living With Jackie Chan! I’m so happy to be welcoming back frequent guest and friend of the blog, the talented and amazing author Jo Knowles! Full disclosure, Jo is a very good friend and she and I have been in the same writing group since 2005. But, even if I didn’t already know and adore her, she would remain one of my favorite authors. 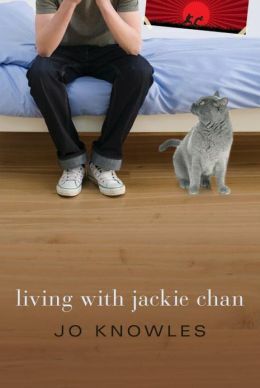 Today we’re shining the spotlight on her newest YA novel, Living With Jackie Chan, a companion novel to Jumping Off Swings. Stay tuned below to enter for a chance to win a signed copy of her new book! In this companion novel to Jumping Off Swings, Josh leaves his home for his Uncle Larry’s his senior year, leaving behind his two best friends, his parents, and most importantly the reminder of what he did. Although he’s left and keeps busy taking karate lessons from his uncle, the memory of that one night with Ellie and the aftermath, her pregnancy, Josh’s avoidance, and the birth of his baby haunt him. Despite Larry’s encouragement to talk about it, Josh refuses. He focuses on his goal to study hard and get into a college far away. 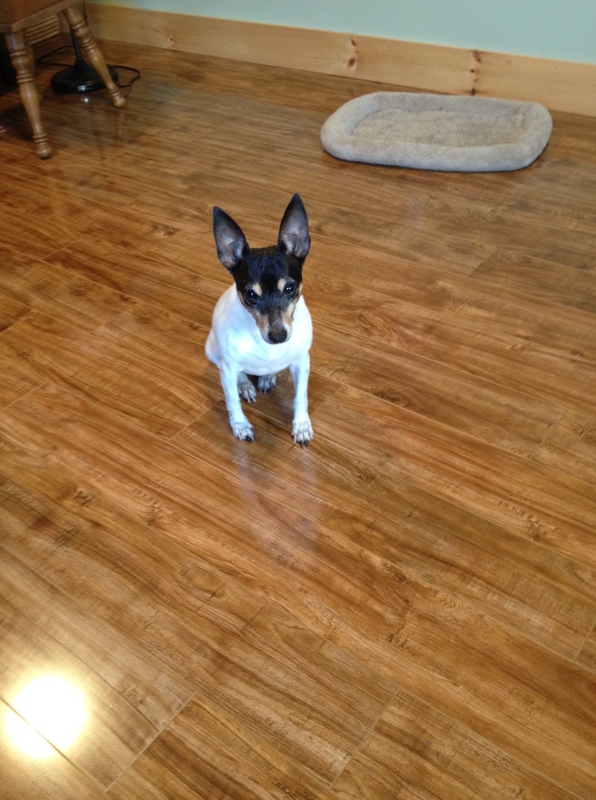 The bright spot in his life comes from Stella, the girl upstairs who takes karate with him. But they can only be friends in karate class because of her extremely possessive and jealous boyfriend. As the school year goes on, Josh struggles with his past and his present, and realizes that running away can’t make the pain go away. With the love of his uncle and the support of Stella, Josh starts to understand what he needs to do. A touching story about healing and learning to forgive yourself. What was the spark for the idea for LIVING WITH JACKIE CHAN? How did Josh’s story come to you and what challenges did you face as you wrote it? After JUMPING OFF SWINGS came out, I started to get letters from readers asking me what happened to Josh, and if he was going to be OK. The more I was asked, the more I began to have this unsettled feeling. Was Josh OK? Pretty soon, I was imagining various scenarios and slowly a story began to form. I could see Josh arriving at his uncle’s apartment feeling scared and ashamed and really lost. I knew I couldn’t leave him like that, so I started to write what happened next. Josh carries a huge burden within him and the only way he can see to deal with it is to escape. You handle his journey brilliantly with much empathy and realism. Stella is an interesting foil for him, she who also has to deal with choices. How did Stella and her story come to you? Aw, thanks Debbi. At first when Stella appeared, I wasn’t completely sure what her role would be. I just saw her there, pushing the stroller, and I let that first scene unfold. What Josh needed was a healthy relationship with someone his age. He needed to see that other people have problems and pasts and challenges, too. I think they ended up being kind of perfect for each other. Uncle Larry is a hoot! I love his optimism and his wisdom. Karate plays a key component in this story. Why karate? I think developing Uncle Larry is probably the most fun I’ve ever had with a character, so I’m glad you like him! I got the inspiration for Larry when I went to see my husband and son test for their first belts in karate. Chip, one of their instructors, was so full of positive energy and enthusiasm. And he was just really sweet and supportive. When I first pictured Larry, that’s who I had in mind. When they recited the words for “What is a true karate man?” I knew that would help form my story. I went home and wrote the words down and used them as a guide from that moment on. Larry has hero-worship for Jackie Chan. Love that! Who is your celebrity (movie or TV) crush and why? Other than Jackie Chan? Hmmm, Matt Damon? I don’t know what it is about that guy but he always seems so nice in the interviews he does. I’m a total sucker for the Bourne Identity series. Also, his mom was a teacher and he is a great supporter of teachers, which makes him a hero in my book. Thanks for the chance to talk about LIVING WITH JACKIE CHAN, Debbi! Jo Knowles is the author of Living with Jackie Chan, See You At Harry’s, Pearl, Jumping Off Swings, and Lessons from a Dead Girl. Some of her awards include a New York Times Editor’s Choice and Notable Book of 2012, An International Reading Association Favorite 2012 Book, an American Library Association Notable of 2012, two SCBWI Crystal Kite Awards, the PEN New England Children’s Book Discovery Award, and YALSA’s Best Fiction for Young Adults. Jo lives in Vermont with her husband and son. For more about Jo and her books, check out her web site, read her blog, find her on Facebook, follow her on Twitter, and for some fun, check out her Tumblr posts. 1. Comment on this post, and for fun, tell me your favorite celebrity crush! I have (too?) many. One is Colin Firth, not only because he looks amazing as Darcy (wet or dry) and is a talented actor, but because of an interview I saw of him once. He’s not only humble and gracious, but when pressed to talk about the gorgeous actresses he works with/gets to kiss, he mentioned his gorgeous wife. Nice! 2. Leave your comment and email address by midnight EST Friday, October 11th. The lucky winner will be drawn at random and announced here on Tuesday, October 15th. 3. NEW RULE: If the winner doesn’t respond with a mailing address in 7 days, a new winner will be chosen. 4. Entrants must have a U.S. or Canada mailing address. Good luck and thanks for stopping by! Happy reading! Thanks to everyone who stopped by to welcome Kathryn Erskine to the Spotlight! 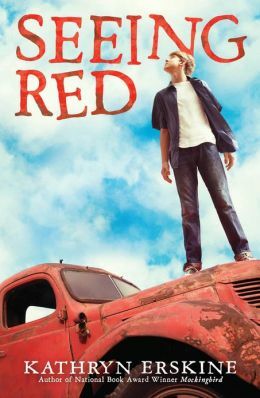 Her newest MG novel, Seeing Red, is available for purchase! If you missed the interview, check it out here. 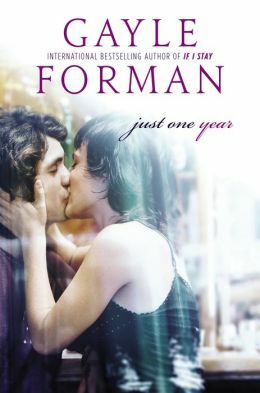 One lucky entrant from that blog post will win a signed copy of this awesome book! Ready to find out who it is? 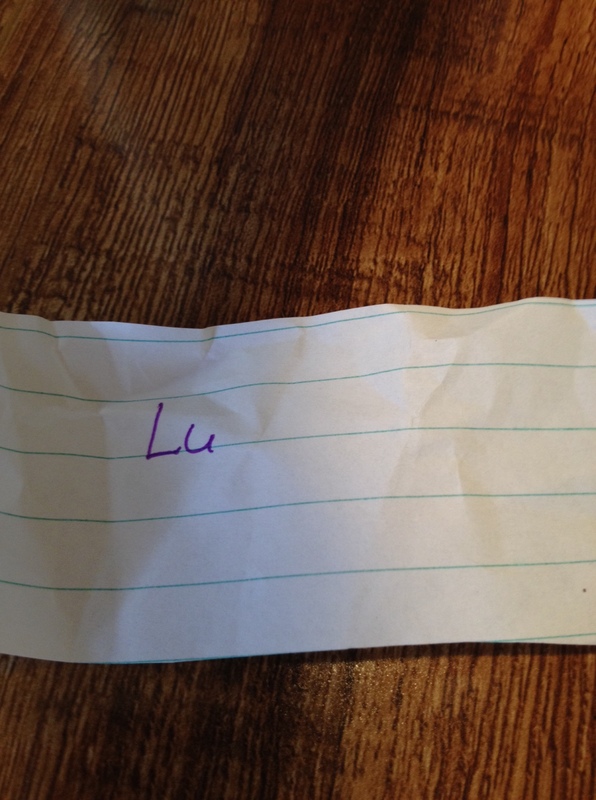 First things first, I wrote all the eligible names for the drawing on pieces of paper. 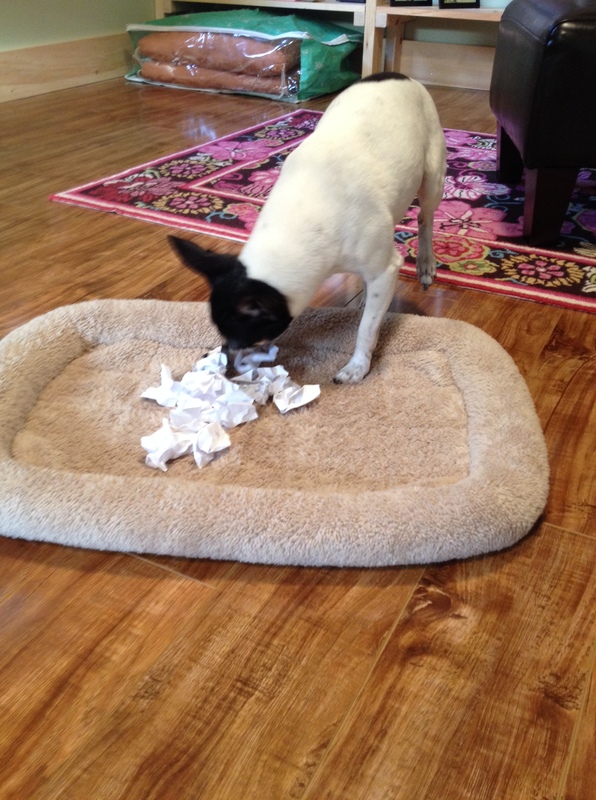 My rat terrier, Trixie, loves to help with the drawing. 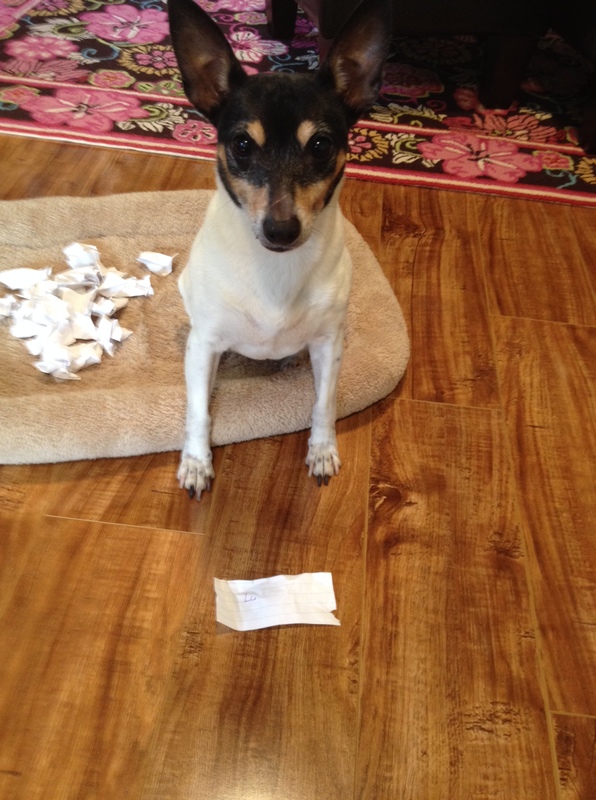 Here she is, waiting for me to finish crumpling the paper (she loves crumpled paper). I give her the signal and she dashes to the pile, sniffing around till she chooses one. I had to fight her for the paper, but she willingly gave it up when I offered her a cookie. Lu!!!! Congratulations! Please email me at just kid ink at yahoo dot com (no spaces) with your mailing address and to whom you want the book signed. To everyone else, thanks for taking the time to stop by and share your yummy dessert faves! Please come back again – more drawings for more great books to come soon!